Home » middle-school » parenting » Does Project Based Learning Work? As my loyal readers know, Smarty is attending a brand new school that was announced as a project-based STEAM school. When someone asks her what she liked best about this first year of middle school, she always answers, "Project-based learning!" But what is really project-based learning and does it really work? Buck Institute of Education defines project-based learning as a teaching method in which students gain knowledge and skills by working for an extended period of time to investigate and respond to an authentic, engaging and complex question, problem, or challenge. This sounds awesome, and Smarty school was implementing PBL across all grades. I am offering here my perspective from parent's point of view. One thing that Smarty kept pointing out during the year, "PBL is fun! It's a lot better than just writing a report or reading a book." She has a good point here. Smarty's projects had a strong hands-on component. Her two main projects in history were an interactive museum of ancient Egypt and a mini-golf course with ancient civilizations theme. She also had several smaller PBL units in her leadership class - one when they needed to create a video about a leader they admire (she chose her principal), then the project about collaboration, and, finally, a project about growth mindset. Almost all these projects were group projects, some with just one other person, big ones with a group of 4-5 kids, so there were ample opportunities to talk and discuss things. They all ended with a sharing time where parents and other grades were invited to view the end results, and Smarty appreciated the opportunity to show off her hard work to others. I can believe her when she says that she is going to remember her 6th grade projects better than anything else that she did in elementary school, because they were bigger and a lot more fun. There were several things that we wished to be different when it comes to project-based learning. For once, we felt strongly that in terms of actual knowledge Smarty learned significantly less than she would otherwise, because she was "specializing" on her specific area within a bigger project. For example, in an Egyptian project, her area was music, and she did collect a lot of interesting facts about ancient musical instruments and even made her own version of one instrument. But... she was not able to tell us much about, say, how Egyptians built their houses, explaining that this was not her area. Granted, part of this is her personality. Obviously, if she were more interested in the subject, she could have learned a lot more about it. And that's exactly my other beef with project-based learning - the projects are supporting a predefined curriculum, not necessarily interests of individual students. Nobody could opt out of the project and do something on a different topic instead, which true project-based learning should allow. Also, the project is given for a certain amount of time and then considered "done" regardless of its real state. Honestly, both big projects this year were anything but done, not just for Smarty's group, but for many others as well. 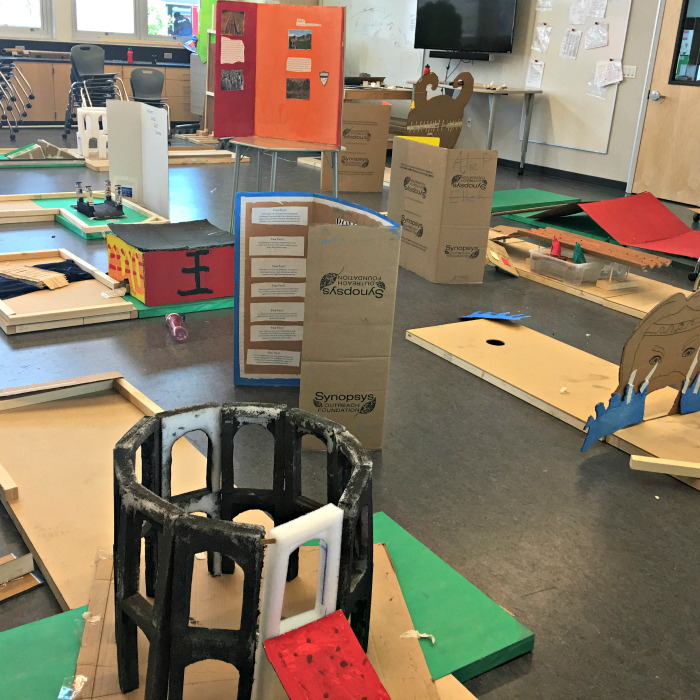 Speaking of time spent on the projects... Smarty's school approach was mainly to have students work during class time on their project, which is admirable, but it does take away from instructional time for a curriculum that was not designed with PBL in mind. As a result, Smarty's entire grade fell behind significantly against what they were expected to cover this year. For example, they only got through half of the unit on Ancient Greece, and didn't "arrive" to Ancient Rome at all - a big Boo! considering how important ancient Rome was for the history of the modern world. While the projects were certainly fun, my husband and I found it deeply disturbing that neither science nor math were well integrated into project-based units. It was especially evident in the golf course project where most golf holes clearly did not take any laws of physics, even gravity, into consideration. I understand that some of the mechanics might have been beyond the grasp of sixth grade, but the result was more of a "tinkering" project of a summer camp than a several months worth of work from a STEAM school. I am not saying that math and science cannot be integrated well into PBL even though it might be challenging in younger grades when kids simply don't have enough background. But one could still do an amazing PBL unit on, say, scientific discoveries of the ancient world. Perhaps this is something in our school's future going forward. Will Something Change Next Year? We were not the only ones not "delighted" with project-based learning this year. Many parents expressed frustration with lack of coordination between teachers when many different projects would be given at about the same time with very short timelines and conflicting delivery dates. This resulted in kids having almost no homework for most of the term, then getting swamped with all the projects that they needed to complete at home, because they ran out of time doing them in school. We had a frank conversation with out principal in the end of the year where we raised some of these issues. We were encouraged to see that she saw them as well. A lot of challenges that we experienced might be related to the fact that almost all teachers are brand new to project-based learning and trying things for the very first time. We can only hope that they are also reflecting on the results of the first year and tweak their plans, so the next year project-based learning can deliver the same amount of fun and a lot more of actual learning than it did this year. What are your experiences and thoughts on project-based learning? In order for project-based learning to be done right, teachers need to be knowledgeable in the areas relating to the project (specialists) and also understand how to work with children. Ideally, it's child-led but that's much harder to do with many students in the classroom. Most people end up doing a modified project-based learning or what ends up being just a fun activity if not done well. Instead of taking on large projects, I prefer smaller inquiry-based learning focused on gaining in-depth understanding of a scientific process or a historical phenomenon. It's much easier to do that well than a large scale project. I think project based learning is hard to pull off in a public school setting without running into the limitations you saw. Especially if you have several different teachers all assigning projects. That takes a level of communication that is hard to pull off. Though the PBL sucked up class time, I will say, it's good they planned class time for it, because otherwise that would have all fallen on you. They just need to find a better balance for this coming year.